In celebration of the final ever episode of The Vampire Diaries on March 10th 2017; I decided to write my own opinion of Nina’s top 5 best performances in The Vampire Diaries, although it is important to appreciate that all of Nina’s performances in each of her appearances of The Vampire Diaries are all amazing for one reason or another such as dialogue delivery, expression or multiple characters. Note: This article contains mild spoilers for five episodes of The Vampire Diaries. Elena puts all of the clues together from recent events that have taken place since she met Stefan; deciding the best approach is to angrily confront him at the Salvatore Boarding House by demanding to know what is happening and who exactly he is. This is a really emotionally charged scene as Elena has serious suspicions that Stefan is not all that she thought he was, especially after having a conversation in the previous episode with a man who claimed to have known him a long time ago when he looked exactly the same. This was the definitive first moment that convinced me that The Vampire Diaries was absolutely not just going to be any other teen horror show, but something much more ambitious and story driven. The Return was on an equal par of pacing and plot twists with how the first season ended with all of the chaos being focused on the actions and reactions of Katherine Pierce and Elena Gilbert respectively. Katherine’s first meeting with Bonnie, followed by Katherine’s and Elena’s scenes with both Stefan and Damon were certainly important to shaping everything from that episode onwards and provided not just season 2, but every episode since with a consistent momentum and genuine progression in such contexts as allies, enemies and relationships within the story driven narrative. 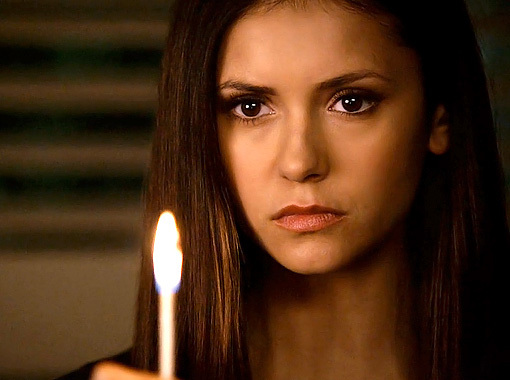 Nina’s performance as Katherine is superb as she showcases Katherine’s ruthlessness in such actions as complimenting an innocent girl’s necklace who believes Katherine is Elena; only to use untwisting her necklace as an excuse to stand behind her so she could progressively kill her in stages and in the process sending a disturbing message to a shocked onlooking Stefan that she wants the moonstone sooner rather than later. Katherine fights Stefan and Damon in a 2 vs. 1 battle with real physicality, while any wounds they inflict on her hurt Elena with Nina’s performance as both characters showing her range once more between action film style scenes in Katherine’s fight scene and Elena’s pain etched across her face as wounds are inflicted. Katherine has flashbacks to her origins as far back as 1490 as it is revealed that Katerina was banished from her native Bulgaria to England after having a baby at a time when she was not married with her father not even allowing her to hold her baby daughter as Katerina’s mother attempts to comfort a clearly distressed and emotional Katerina; as her father takes her baby away for adoption. When in England, Katerina meets Klaus and Elijah without knowing anything to do with vampires, doppelgangers or how her family line of doppelgangers connects with Klaus’ curse. Upon her discovery, Katerina makes a run for it, but shows her true survival instinct and cat-like reactions by turning herself into a vampire to escape the group who are looking for her and returns to her family home in Bulgaria in 1492 only to find that Klaus has murdered her entire family with extreme brutality. This was such an eye opening scene as it proves that Katerina who was once playful yet harmless had no-one else left in the world to bring her back from the edge after her family had been slaughtered and needed to turn off her humanity switch to overcome what her life had become. Nina successfully portrays Elena Gilbert in the modern day, a decaying Katherine who has been starved of blood since the masquerade, Katerina as a Bulgarian in 1490 and the development of her English accent after being banished with many important scenes taking place in which Nina is effectively talking to herself as Elena Gilbert in conversation with the modern day Katherine Pierce. Managing that many characters, accents and mannerisms is all supremely impressive! If ever a casting director or any major personnel involved with casting for a film or any dramatic role needed a highlight reel to showcase Nina’s range as an actress; this would be the scene to steal the show. 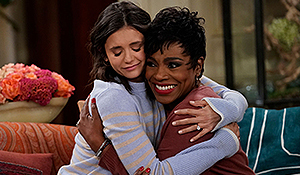 Nina provides a world class performance in which Elena Gilbert suddenly realises that Jeremy is dead and that he is not coming back after holding onto the hope that he would be resurrected from wearing the ring which usually protects from death at the hands of the supernatural. After realising that her brother is not coming back, she paces back and forth thinking about funeral plans and the cover story for Jeremy’s death; resulting in a major breakdown in which a huge amount of grieving and emotion spills to the surface. Elena starts pouring gasoline on everything as she tells her friends that she has no family left and how everything in her family home reminds her of all the family she has sadly lost as the lit match burns her finger and almost ignites. 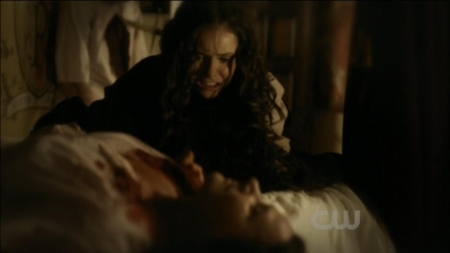 Elena falls to her knees, tears streaming down her face, begging her friends to make her pain stop. The scene has even reached over 1.7 million views on YouTube. Now that is saying something for its true emotion and quality of acting. Happy TVD Series Finale Day, Today we say goodbye.